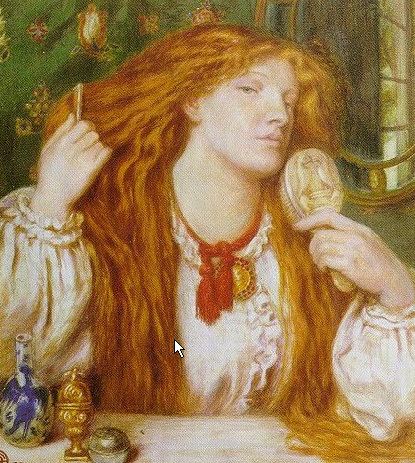 Like his Pre-Raphaelite brethren, Dante Gabriel Rossetti used live models in his works. Throughout the course of his career, the same faces grace his canvasses, ranging from family members to lovers. Occasionally, models Elizabeth Siddal and Alexa Wilding are confused for each other. Other models may be misidentified completely. so this post is intended to be a brief overview of women seen in his paintings. Think of it as an introduction, because this is far from a comprehensive list. For his earliest works, Rossetti’s models sprang from his own family tree. In The Girlhood of Mary Virgin his mother, Frances Polidori Rossetti, posed as St. Anne, the mother of the Virgin Mary. His sister, Christina Rossetti, posed as Mary. Christina Rossetti posed again as Mary in Rossetti’s next painting Ecce Ancilla Domina (Behold the Handmaid of the Lord). 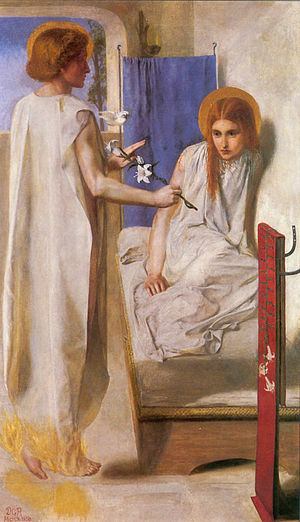 Rossetti’s brother, William Michael Rossetti, is seen as the angel Gabriel. Due to dramatic license in the 2009 production Desperate Romantics, many people wrongly believe that it was Elizabeth Siddal that posed for Mary. ‘Ecce Ancilla Domini’ (Behold the handmaid of the Lord), Dante Gabriel Rossetti, 1850. 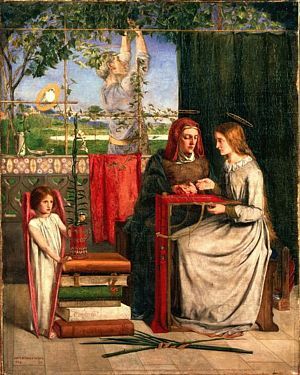 Christina Rossetti is seen as the Virgin Mary, William Michael Rossetti as Gabriel. Elizabeth Siddal was introduced to the Pre-Raphaelite Brotherhood around 1849-50 when she posed for Walter Deverell’s painting Twelfth Night. She appears in several early Pre-Raphaelite works, Ophelia by Sir John Everett Millais perhaps being the most famous. In the 1850s, her relationship with Rossetti began in earnest and she posed solely for him. He took on the role of tutor and encouraged her artistic abilities, thus making her both a model and creator of Pre-Raphaelite art. She and Rossetti were married in 1860; you can read about their marriage in this post, Pre-Raphaelite Marriages: Dante Gabriel Rossetti and Elizabeth Siddal. Siddal was addicted to laudanum due to poor health and gave birth to a stillborn daughter, plunging her deeper into depression and addiction. In 1862, she died of a laudanum overdose. Rossetti buried his manuscript of poems with her. Her death at the young age of thirty-two and Rossetti’s later retrieval of the poems have contributed to the sense of tragedy that now surrounds Siddal’s name. 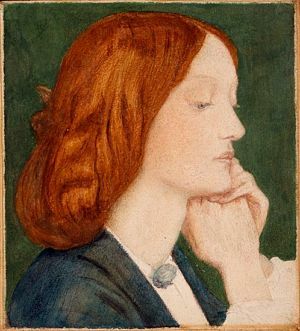 Portrait of Elizabeth Siddal (1854), Dante Gabriel Rossetti. 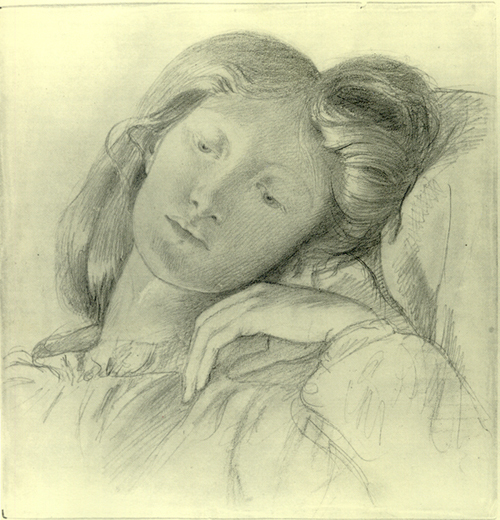 Rossetti’s drawings of Siddal are legendary due to their delicacy and beauty, as well as the sheer number of them. 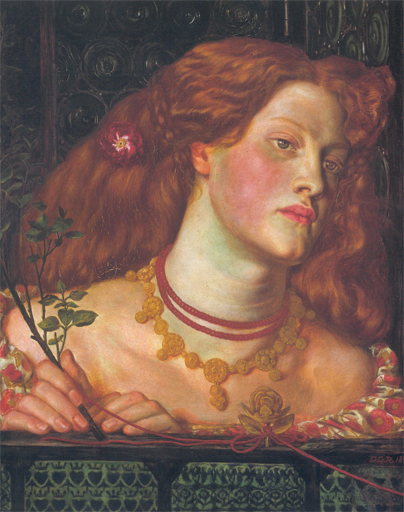 Artist Ford Madox Brown described Rossetti’s obsessive sketching of her as a ‘monomania’. When we look back on Rossetti’s body of work, especially after her death, it is obvious that this monomania is not limited to Elizabeth Siddal. He branched out to include other models and their faces echo from painting to painting. Siddal was the first to be painted and drawn in this obsessive way and was the first to be described as his muse. 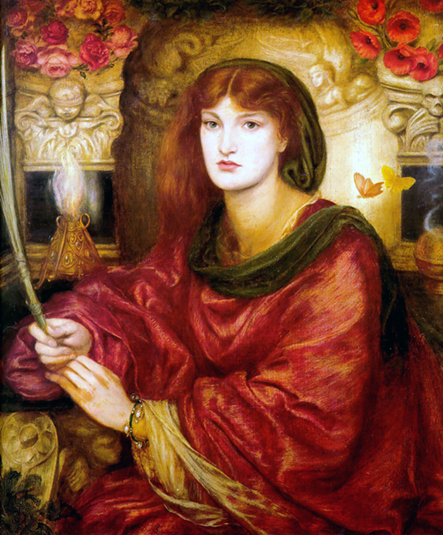 Rossetti had cast her in the role of Beatrice to his Dante. 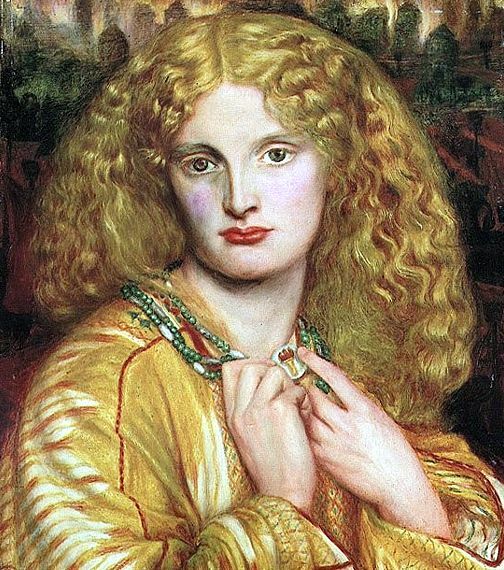 Before his marriage, Rossetti painted model Annie Miller and this was a source of friction between DGR and Siddal. Discovered by fellow Pre-Raphaelite William Holman Hunt, Miller was rescued from the slums and Hunt arranged for her education. 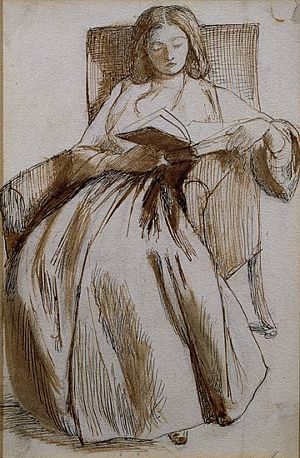 When Hunt left to paint in the Middle East, he instructed Annie Miller not to sit for Rossetti. Neither Rossetti or Miller did as they were told. 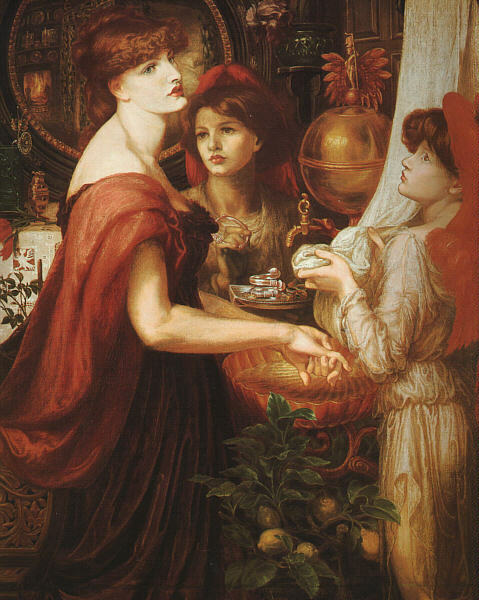 In 1859, Dante Gabriel Rossetti painted Bocca Baciata and it was a radical change in style. Afterwards, his work gravitated towards images of a single female, quite often depicted from the bust up and surrounded by flowers, jewelry, and other symbolic objects. Why the change in style? In the late 1850’s Rossetti had definitely matured as an artist, compared to the young idealist he was in 1848 when he helped to form the Pre-Raphaelite Brotherhood. It can also be assumed that changes in his personal life had an influence on his work. 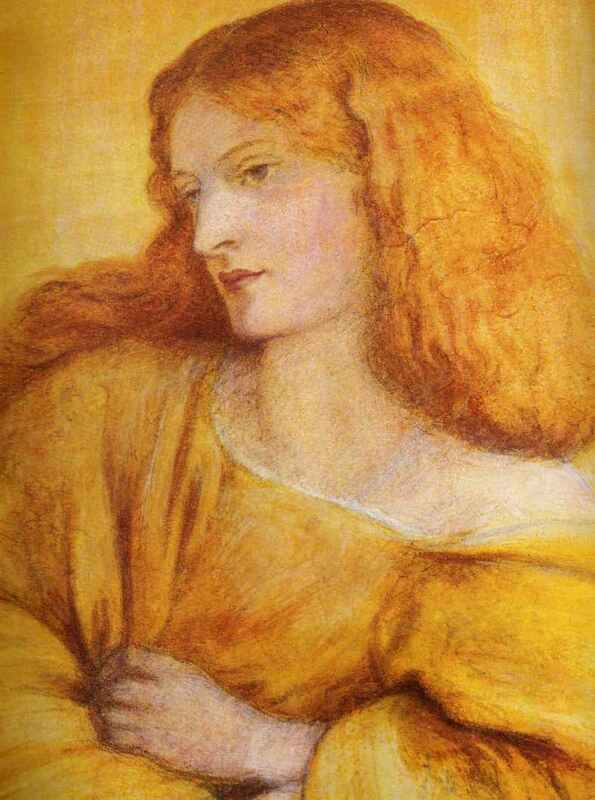 Siddal had been the primary face in his work for several years. 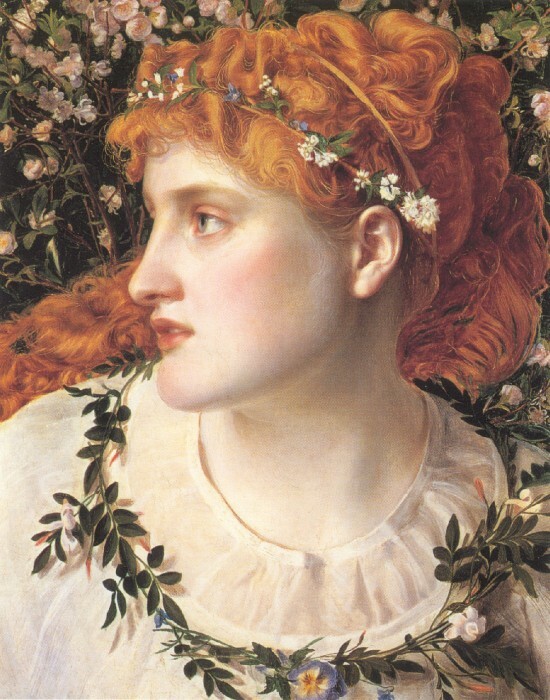 However, in 1858, he met Fanny Cornforth. Fanny was unlike any model he had ever used. Almost always described as a prostitute, she was carefree and I think Rossetti was attracted to her charming combination of beauty and humor. He first engaged Fanny to pose for his unfinished ‘fallen woman’ painting, Found. A year after meeting her, he created Bocca Baciata. I don’t think that it is a coincidence that after meeting Fanny, who in all likelihood was his first sexual partner, his work develops a new and startling style. 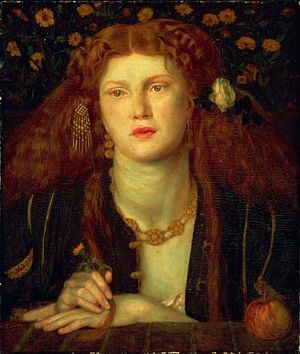 Fanny Cornforth remained in the artist’s life for many years and their friendship seems to have been an important one for both of them. Devastated when Rossetti married Siddal in 1860, Cornforth married a man named Timothy Hughes. After Siddal’s death of a laudanum overdose, Fanny reentered Rossetti’s life. 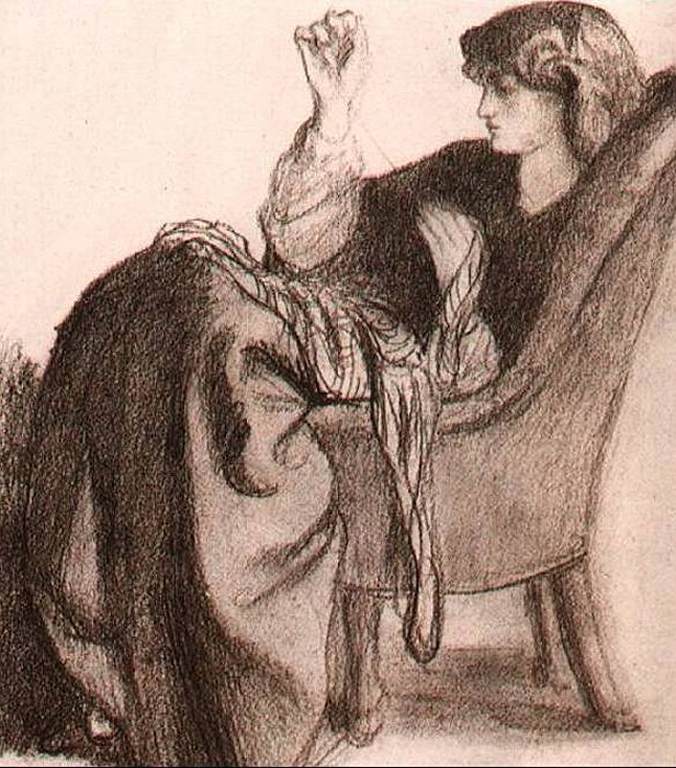 She is seen in much of his work and is often described as serving as the housekeeper in Rossetti’s home. I highly recommend reading Stunner: The Fall and Rise of Fanny Cornforth which, thus far, is the only full-length biography of Cornforth. The buxom model was not without her detractors, though, as mentioned in my previous post The Bias Against Fanny Cornforth. Prior to his marriage, Rossetti met the young Jane Burden (later Morris) while attending a theatre performance with artist Edward Burne-Jones. Rossetti declared her a stunner and she was swept into an exciting new world of art and literature. But Rossetti was quickly summoned to the side of Elizabeth Siddal, who had fallen ill again. At this point, William Morris idolized Rossetti intently and may have seen himself as Jane’s protector when Rossetti left Oxford so suddenly. It’s hard to imagine William and Jane’s courtship as they were both incredibly shy. A story persists that while painting Jane as La Belle Iseult, he wrote “I cannot paint you; but I love you.” on the back of the canvas where Jane would be able to see it. Jane and William Morris married in 1859. Jane was able to reinvent herself and the daughter of illiterate parents became a voracious reader who was proficient in other languages. Several years after the death of Elizabeth Siddal, Rossetti entered a tortured phase in his life. He was not thriving physically or mentally. After abstaining from alcohol most of his adult life, he began to drink around 1866. Rossetti also found himself falling in love with Jane Morris. 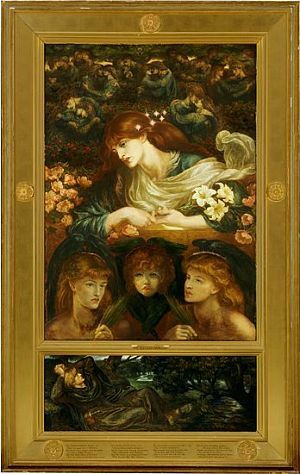 Rossetti’s relationship with Jane invigorated his return to poetry and he began his sonnet sequence The House of Life. As he grew closer to publication, he wanted to include poems he had written years before. The poems that had been buried with his wife as a final, loving gesture. Words written while he was married to Siddal would now be published along with the sonnets inspired by Jane. Seven years after Siddal’s death, the poems were exhumed. 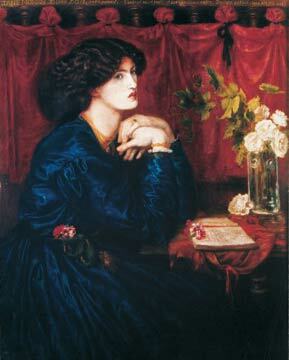 Rossetti had a new muse and she was the wife of his friend. The final model I’ll share is the one that causes the most online confusion. 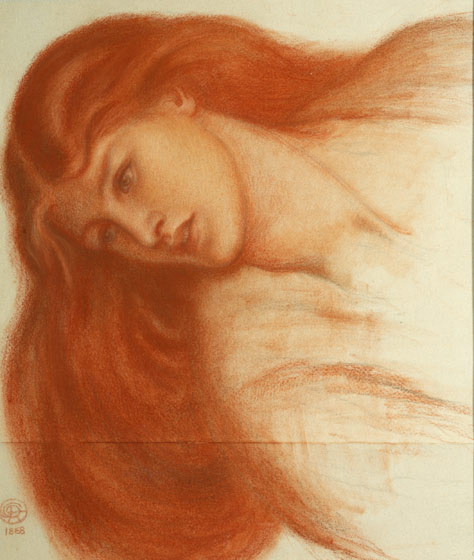 I see her misidentified as Elizabeth Siddal quite often. When Rossetti spotted Alexa Wilding on a busy street, he immediately approached her to sit for him. She was quite tall and even though he painted works featuring Alexa during the same time period he was painting Jane, they could not be more different in looks. They were physically different types, yet Rossetti would embellish and add his characteristic touches to both: those Rossetti lips, strong arms and lengthened necks. Kirsty Stonell Walker has written an entertaining fictionalized account of Alexa’s life, A Curl of Copper and Pearl . 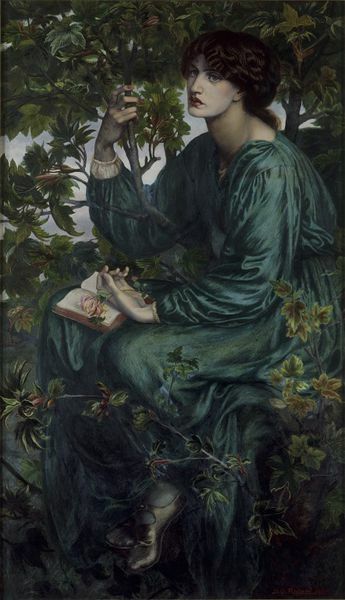 Rossetti’s painting A Vision of Fiammetta is often mistaken for Alexa Wilding, but the model was artist Marie Spartali Stillman. 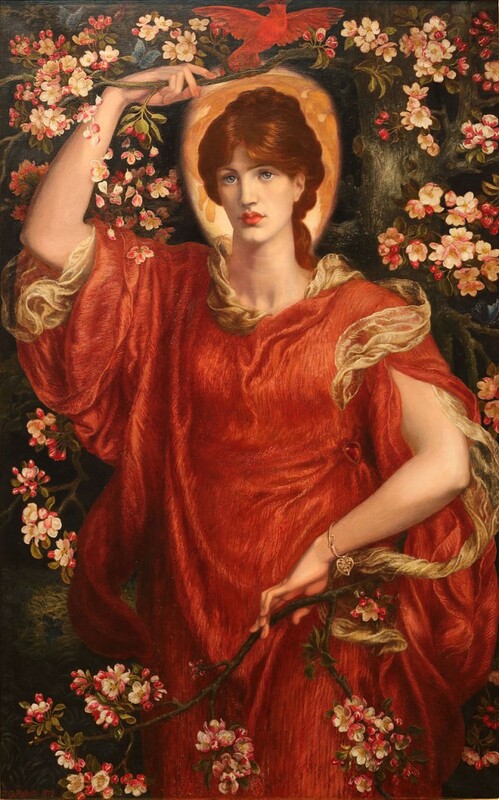 ‘A Vision of Fiammetta’, Dante Gabriel Rossetti. Model: Marie Spartali Stillman. Another common mistake is the misidentification of the lover in The Blessed Damozel. Due to the subject matter of a departed lover in heaven, the notion that painting features Elizabeth Siddal is understandable. It is, however, Alexa Wilding. ‘The Blessed Damozel’, Dante Gabriel Rossetti. Based on his poem by the same name. 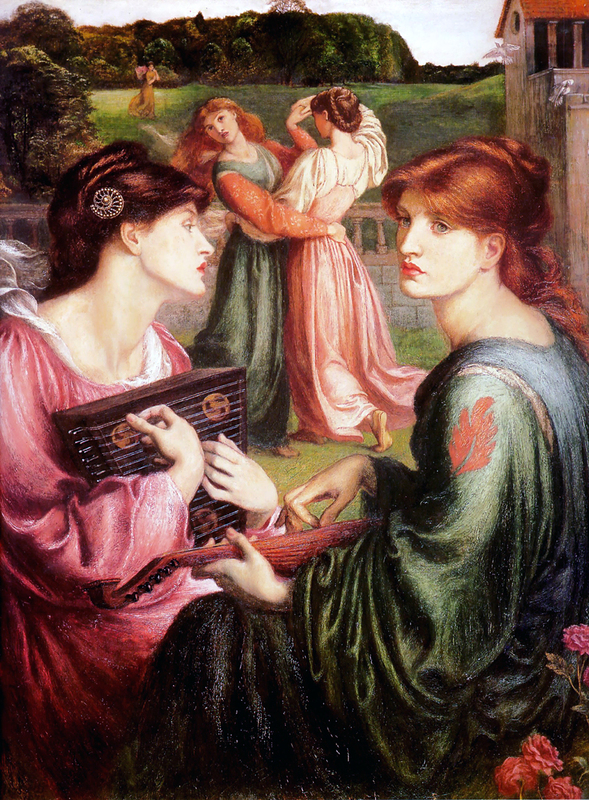 The women who inspired Rossetti’s works were vastly different from each other. They came from varied backgrounds and none of them fit a particular physical type. This is an aspect I adore about Rossetti; he chose models that were in many respects unconventional beauties. When he painted them, he added what we now see as typical Rossetti details that are now indicative of his work. He made their features an important part of his artistic expression. So much so that now we can look at them in his works and say, without knowing them, that is a Rossetti woman. Yet they are each deserving of being set apart and remembered, as much as possible, for the unique individuals they were. Fascinating and interesting! 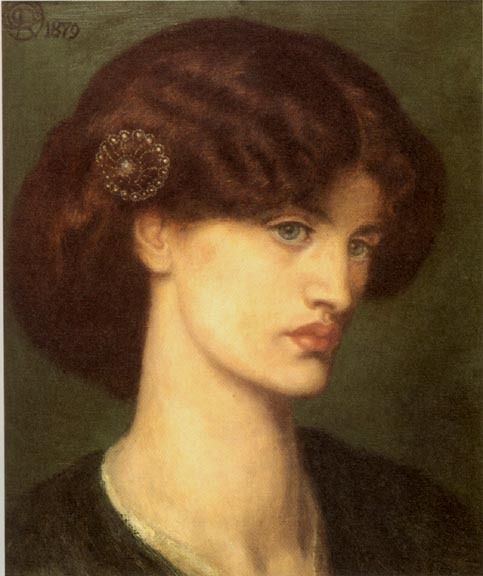 I must admit I used to think that all Rossetti’s later paintings were of Jane Morris! I do wonder if he chose Alexa Wilding, Stillman and others because they bore a passing resemblance to Jane Morris who probably wasn’t always available. It’s interesting also that both Siddal and Stillman trained as artists themselves. I am so looking forward to the Marie Spartali Stillman exhibition when it comes to the UK next month! Technically I think she was Rossetti’s equal.